From his law office in Atlanta, Georgia, attorney Ralph Ellis represents injured and disabled workers who seek their rightful Social Security Disability, workers' compensation and veterans' disability benefits. 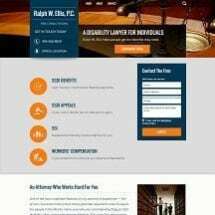 Serving clients throughout the greater Atlanta metro region, his law firm, Ralph W. Ellis, P.C., has become the trusted source for individuals and families across the area struggling to make ends meet as the result of a debilitating injury that prevents them from working. Over the course of his more than 18 years practicing law, Mr. Ellis has acquired a wide and varied background that makes him well-suited to handle your needs. He began his legal career as an insurance defense attorney, gaining invaluable insight into the industry and the tactics insurance companies use to reduce or deny claims. Following that, Mr. Ellis served a long tenure with state's office of the attorney general, where he served as senior assistant attorney general as well as the first practice group leader for the office's workers' compensation section. He was also heavily involved with the office's labor and employment and civil rights sections. This means he has the skills and resources necessary to help you file your claim or appeal a denied claim in order to help you secure the finances you deserve to support yourself and your family. He also promises to remain by your side throughout the long and complex process to ensure the best odds of helping you obtain the positive results you expect. If you need help obtaining your SSDI, SSI, workers' compensation or veterans' disability benefits, you can contact Mr. Ellis at his law office, Ralph W. Ellis, P.C., to schedule a free initial consultation.